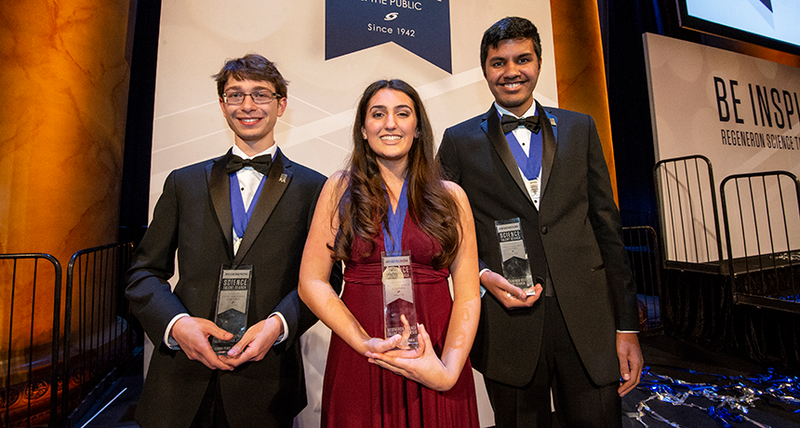 Ana Humphrey (center), Samuel Weismann (left) and Adam Ardeishar (right) took home first, second and third place in the 2019 Regeneron Science Talent Search. Ana Humphrey, 18, took home $250,000 and first prize. Samuel Weissman, 17, won second place and $175,000. Adam Ardeishar, 17, came in third, winning $150,000. “Looking at today’s finalists and thinking about the students to come, I know we are in good hands,” says Maya Ajmera. “I am thrilled that, together with Regeneron, we are able to continue this competition, now in its 78th year, and provide these young people with a platform to showcase their science.” Ajmera is president and chief executive officer of Society for Science and the Public. This organization created the Science Talent Search in 1942 and still runs the competition.